There’s been a flurry of IWM activity over the last few weeks with the IWM Forums kicking off across metro Melbourne and parts of regional Victoria. 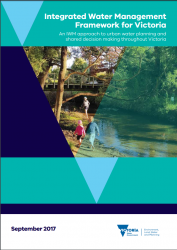 Leaders from water corporations, local government, CMAs, Traditional Owners and DELWP started the process outlined in the Integrated Water Management Framework for Victoria. The forums were held in Maribyrnong, Werribee, Yarra, Dandenong and Western Port catchments in Melbourne plus Goulburn Valley, Coliban and Barwon regions. Each discussed the unique context and potential opportunities with their region. There was an excellent spirit of collaboration and enthusiasm in every single conversation, with a consistent take home message of – let’s get going! Congratulations to the forum Chairs on establishing a culture of delivery through partnerships. DELWP will be running some follow up workshops with stakeholders to progress the Strategic Directions Statements for each forum to clearly document vision, forum area needs, short term opportunities for collaboration and longer term direction within each region. Forums will be established across the remainder of regional Victoria over the next 12 months with the Great Southern Coast, East Gippsland and Central Highlands Forum expected to be formed in the new year.